I'm not talking about my house; the McCollum proposal to slash band funding has always been a non-starter here in the blue house on Maple Street. It's the House of Representatives that has defeated the proposition to cut the annual budget for military bands from $388 million to $200 million, and that's real news. A spokesman for Representative Darrell Issa said, "Military bands are an essential element of our armed forces esprit de corps and are widely recognized and appreciated public symbols of our military tradition of ceremony, pageantry and discipline." That's well put, in my opinion. Many Americans consider bands a frill, a sweet litle bit of frosting on the Armed Forces' cake. But bands exist not as a frivolous addition to our fighting forces. The purpose of military bands is, to use a term you see on bumper stickers from California to Maine, to Support Our Troops. North San Diego's North County Times has the story. From Spritz, the lounge of the Orlando Doubletree Universal, it's "The Girl From Ipanema." 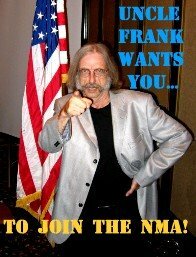 Thanks to Gary Mosse for putting this online, along with more videos of the 2012 NMA reunion. Oh, and while you're enjoying this, check out the bass player. Chord changes? Like a rock. Creativity, flow and taste? Like a rock. NMA Reunio 2012, Scene 22: "All on the same page." Time: Wednesday afteroon at the first rehearsal of the Concert Band. Cast: Wilbur Smith and the NMA Concert Band. Smitty: Okay, get up "The Last Full Measure of Devotion." This is a vocal feature, and I guarantee that Stephanie Richards will bring down the house with this. A few seconds of incomprehensible discord ensue. Smitty cuts off the band. Smitty: Is everyone playing the same thing? This is "The Last Full Measure of Devotion." General murmurs of assent are heard from the band. A messy jumble of sound is heard. Trombone player: Smitty, what are we playing? Smitty: (Patiently) "The Last Full Measure of Devotion." Trombone player: "The Last Full Measure." Smitty: Right. "The Last Full Measure of Devotion." The sound is ruinous, particularly the sound from the low brass. Smitty: Trombones, are you with us? We're playing "The Last Measure of Devotion." Smitty: Beginning at the first measure. Trombone player: Did you say the first measure? Trombone player: The first measure of "The Last Full Measure of Devotion"? The trombone section gathers in a huddle. They argue amongst themsleves for a half-minute. Finally, they sit back down. Trombone player: Okay, Smitty, we're ready now. NMA Reunion 2012, Scene 14: "Officers Don't Know Everything." Frank Mullen: What an idiot! Frank: --and there's this box of rags full of his old skivvies, stenciled with his name and rank. We took them back to the band room and put them in the head to use as toilet paper. Terry Chesson: What? I never knew about this! Frank looks at Dan. Dan looks back at Frank. Frank looks at Terry. Frank: Well, of course you didn't know; you were the bandmaster. At the Saturday night banquet of the 2012 reunion of the Navy Musicians Association, the Earl Benge Volunteer of the Year Award was presented to Wilbur Smith. As regular attendees know, the NMA Concert Band's is crucial to the success of a reunion. With only handful of rehearsals, Wilbur manages, every year, to turn a collection of professional musicians, part-timers, teachers and amateur enthusiasts into a group whose Friday night concert excites an audience that expects the best: the Navy Musicians Association family. Any graduate of the Assistant Bandleaders Course knows that preparation is the key to productive rehearsal. Months before we sit in a hotel ballroom listening to the tuning Bb at that first Wednesday rehearsal, Wilbur has been at work. His through preparation would be eason enough to hand Smitty an award, but Wilbur juggles a number of other year-round NMA duties. His work with the O.L. McMillan Scholarship helps selected young musicians with their tuition. His supervision of our Travel Fund provides financial help to selected members who, without that help, might not be able to join us. Prior winners of the Earl Benge Award have found the trophy to be a striking addition to den or study. Wilbur may discover that its weight and size also make it an efficient paperweight when concert band scores, scholarship applications and NMA correspondence become overwhelming. The carriage has turned back into a pumpkin and I'm back in the Midwest, doing what Midwesterners do. But I'm not done. It will take a few more days for me to finish reminiscing, reporting and reliving the 2012 NMA reunion. So keep stopping by for a while. The party may be over, but there are still stories to be told. It's mighty quiet here at the Doubletree. A few MUs are staying one more night, taking time to visit family and see the sights. But it's over. Those with long drives were on the road before dawn. The sun rose over a hotel full of MUs and their families packing their cars and hopping on airport shuttles. I'll likely be incommunicado for the next day or two, as I, too, must head back home. I'll be back in touch soon with more photos, video footage and stories. But right now, it's nap time. A nap, a snack, and then back to beddie-bye for the night. During my time in San Fransciso, a rental trailer like this hauled Showband West's gear on tours that encompassed the western states. This one has had only one destination: Orlando. As I write this, Bob Leketa and Kim Holl are driving back to Virginia Beach, pulling behind them a full cargo of music stands, computers, pianos, amplifiers, cords, mics, signs, banners, shirts, photo albums, ballcaps and, for all I know, an MU or two who fell asleep during the loading last night. The sharpest man in the room. An NMA banquet is a family affair. This year, member John Vasquez brought his grandson, a member of the Junior ROTC, and, like his grandfather, a percussionist. The young man hopes to also follow John into the ranks of Navy Musicians. He's certainly learned the First Rule of the military musician: How you look is as important as how you sound. A mark of an effective leader is the willingness to find, nurture and train those who will carry on the duties of his position. Wilbur Smith, condcutor of the NMA Concert Band, knows this. Before this year's NMA banquet, he began the process of seeking the MU that will one day relieve him of his baton. This may take a few years. The Saturday night dinner and dance is the highlight of a Navy Musicians Association reunion. It's fun, of course, but our dress adds a little formality to the occasion. We don't sport white tails and tux, but we definitely put away the cutoffs and tee-shirts that have served us so well through the week.